Pine Ridge, South Dakota, U.S.
Ernie LaPointe (born 1948) is the great-grandson of Hunkpapa Lakota chief, Sitting Bull (Tatanka Iyotake). He is a Sun Dancer, Native American author, orator, and president and founder of the Sitting Bull Family Foundation (SBFF). The documentary Sitting Bull's Voice recounts LaPointe's journey from childhood through struggles overcoming alcohol and marijuana use related to PTSD while homeless, the embracement of his culture and the spiritual ways of his ancestors, to his quest to become an authoritative voice for his great-grandfather. LaPointe lives the traditional way of the Lakota, following the rules of the sacred pipe. He resides in Rapid City, South Dakota with his wife Sonja. LaPointe was born on the Pine Ridge Indian Reservation in South Dakota. He is the son of Claude LaPointe and Angeline Spotted Horse LaPointe. LaPointe grew up in Rapid City, SD, where he attended public school. His mother was a housewife and his father worked in a lumber yard in Rapid City. At the age of ten Ernie lost his mother to cancer and at seventeen his father died of a heart attack. At eighteen, LaPointe joined the Army and was stationed in Korea, Turkey, Germany, and various locations around the United States. He did one tour in Vietnam in 1970-1971 and received an honorable discharge in 1972. While growing up LaPointe's mother told him not to tell others about his relationship to Sitting Bull. Before his mother's death Lapointe was told that a day might come when it will be important for him to set the record straight about his great-grandfather, Sitting Bull. In 1992, Ernie spoke publicly about Sitting Bull's direct blood descendants by speaking at the induction of Sitting Bull into the Hall of Fame of American Indian Chiefs at Anadarko, Oklahoma. LaPointe then began writing a book Sitting Bull: His Life and Legacy and speaking to audiences throughout the country and abroad about his great-grandfather. In 2012 LaPointe began work on a documentary film project, Sitting Bull's Voice with director Bill Matson. The film recounts the Sitting Bull family oral history and follows LaPointe's journey from childhood to becoming the voice for his great-grandfather. The film has been shown at 10 film festivals around the country, winning four awards and two Best Film awards. In January 2013 the San Pedro International Film Festival in San Pedro, California honored it with the Best Documentary Award; in 2014 the film received the Best Native American Feature Award from the Indie Spirit Film festival in Colorado Springs, Colorado; and at the last festival in January, 2015 the film received the 2015 Best Picture-Documentary-Feature Honorable Mention Award (Second Place) at the Flathead Lake International Film Festival. The Sitting Bull Family Foundation (SBFF) is a nonprofit corporation founded by LaPointe and according to the organization's website, its mission is to offer the accurate oral history of Sitting Bull through storytelling, by sharing his exemplary cultural and spiritual way of life, and to awaken cultural awareness in the traditional Lakota way of life. 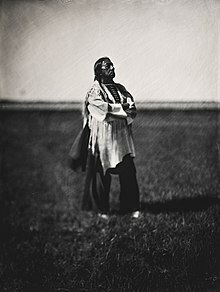 The website provides evidence of LaPointe's connection to Sitting Bull along with his being descended from a long line of chiefs on both his mother's and father's sides of the family. His grandfather, Spotted Horse, was the son of Hunts Enemy and the grandson of Chief Charging Bear. His great-grandmother's (Tokala Win LaPointe) brother was Chief Painted Horse. LaPointe and his wife spend much of their time traveling throughout the United States and abroad speaking at universities, museums, and film festivals about the history of Sitting Bull as well as the cultural heritage of the Lakota people. In 2010, LaPointe was invited to be a keynote speaker at the University of Notre Dame graduation ceremony. A lock of hair and leggings attributed to Sitting Bull were in the collection of the National Museum of Natural History, Smithsonian Institution. On December 5, 2007, LaPointe went to the National Museum of Natural History for the repatriation of both items. A ceremony with regard to Sitting Bull's hair followed at LaPointe's South Dakota residence. A small portion of hair was also given to a DNA specialist in Europe to enable those who believe they might be related to Sitting Bull to have a DNA test done. LaPointe, along with his sisters Marlene Little Spotted Horse Andersen, Ethel Little Spotted Horse Bates, and Lydia Little Spotted Horse Red Paint, have been petitioning the government for the reinterment of their ancestor's remains from a grave in South Dakota to the site of Sitting Bull's greatest vision: the Battle of Little Big Horn. LaPointe met his wife Sonja at a Pow-Wow in Rapid City, SD. LaPointe lives the traditional way of the Lakota following the rules of the sacred pipe. LaPointe, Ernie. Sitting Bull: His Life and Legacy. Gibbs Smith. 2009. The Authorized Biography of Sitting Bull by His Great Grandson . Prod. Bill Matson. Perf. Ernie LaPointe. 2011. Sitting Bull's Voice . Prod. by Ernie LaPointe, Bill Matson, and Tim Prokop Perf. Ernie LaPointe. 2014. LaPointe, E., Northwest Art Center (Minot, N.D.), & Minot State University. (2013). The Sitting Bull connection. ^ "Shane Balkowitsch Wet Plate Collodion Ambrotype Photography". Sharoncol.balkowitsch.com. Retrieved 2016-09-17. ^ "Eternal Field :: State Historical Society of North Dakota (SHSND)". Digitalhorizonsonline.org. 2014-09-06. Retrieved 2016-09-17. ^ a b "NMNH - Repatriation Office - Reports - Plains - Sisseton-Wahpeton". Anthropology.si.edu. Retrieved 2016-09-17. ^ Kincaid, Sara. "Smithsonian traces Sitting Bull's descendants". indiancountrynews.com. Indian Country News. Retrieved 4 October 2016. ^ White, Dustin. "Sitting Bull descendant shares story". Lakota Country Times. lakotacountrytimes.com. Retrieved 4 October 2016. ^ Vogrin, Bill (2014-10-17). "Side Streets: Royalty to attend film about combat vet's recovery from PTSD and embracing Indian heritage". Coloradosprings.com. Retrieved 2016-09-17. ^ "555collective - PTSD and Sitting Bull". 555c.org. 2014-01-11. Retrieved 2016-09-17. ^ a b c "LaPointe to speak on Sitting Bull | Local". Rapidcityjournal.com. 2016-09-08. Retrieved 2016-09-17. ^ a b "Programs and Events 2009 | Helsinki, Finland - Embassy of the United States". Finland.usembassy.gov. 2009-11-08. Retrieved 2016-09-17. ^ "Ernie LaPointe on Tatanka Iyotake – Sitting Bull". Live Encounters. 2015-04-04. Retrieved 2016-09-17. ^ "Congratulations to Ernie LaPointe | www.American-Tribes.com". Amertribes.proboards.com. Retrieved 2016-09-17. ^ "Sitting Bull's Voice by Bill Matson — Kickstarter". Kickstarter.com. Retrieved 2016-09-17. ^ "Sitting Bull descendant shares story". Lakota Country Times. 2014-10-09. Retrieved 2016-09-17. ^ "Native American youth learned about Spirit Trees and other cultural history at gathering". Myinforms.com. Retrieved 2016-09-17. ^ "Sitting Bull's Family" (PDF). Sittingbullfamilyfoundation.org. Retrieved 2016-09-17. ^ "Ernie LaPointe coming to Germany". Amertribes.proboards.com. Retrieved 2016-09-17. ^ "Genome of a chief". Science News. 2010-08-17. Retrieved 2016-09-17. ^ "Sitting Bull relatives want remains moved | Local". Rapidcityjournal.com. 2007-02-22. Retrieved 2016-09-17. "Friends Interview With LaPointe". Friendslittlebighorn.com. Retrieved 2016-09-17. ^ "Ernie LaPointe – A Message From Sitting Bull's Great Grandson". Live Encounters. Retrieved 2016-09-17.